We provided a large proportion of the electrical products used on this project, for instance, the containment and fixings used to suspend the rows of lighting. Aim Altitude’s new building at Bournemouth Airport is a hi-tech unit designated for cabin interiors, which replaces three previous buildings on the same site. With further units around the world specialising in other aircraft parts, this new building forms part of their strategy to deliver market-leading products and services for every aspect of an aircraft’s interior. We recently supplied Best Electrical on this exciting project, who installed the electrics required. Best Electrical have a wide range of experience in commercial electrical installations, which are all carried out to the highest standard by their fully approved NICEIC contractors. We provided a large proportion of the products used by Best Electrical on this project, such as the cable tray, trunking, studding, channel, washers, nuts, bolts etc. 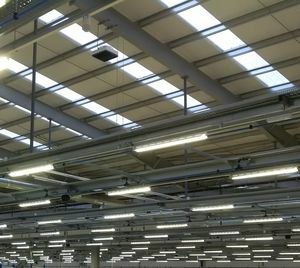 The rows of lighting were installed using the containment products and fixings we supplied. AIM Altitude both design and manufacture aircraft interiors and parts for leading airlines and militaries across the world. So now their new base is complete the parts produced there will be distributed worldwide ready for final assembly inside various famous aircraft such as Boeings and Airbuses.